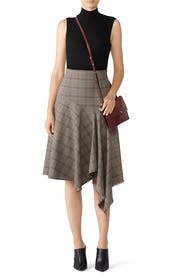 A swingy handkerchief hem flutters with every step you take in this plaid skirt from Nanette Lepore. Pair it with the Shinola Accordion Crossbody. 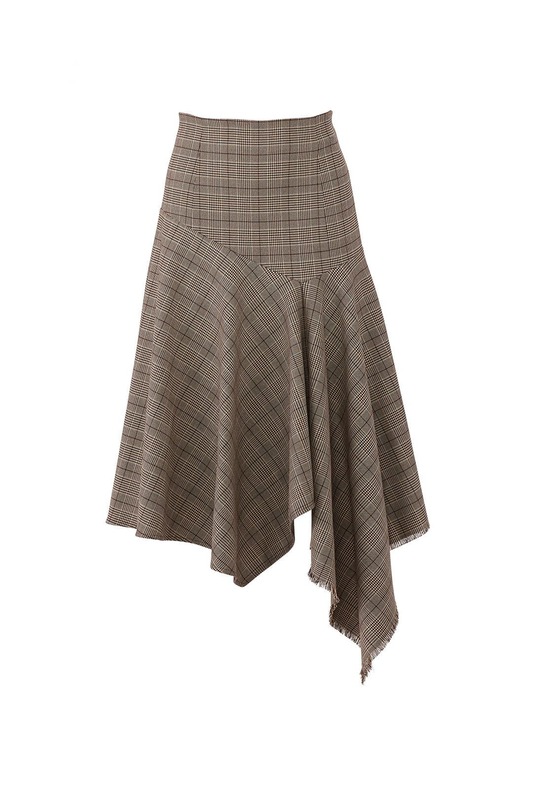 Brown plaid skirt (100% Polyester). Skirt. Exposed back zipper closure. Fully lined. 27" from waist to shortest hemline, 36" from waist to longest hemline. Made in the USA. Great to pair with boots! It's definitely longer than I thought. I am 5'10" and this was below the knee. If you wear this it will be the statement piece of the outfit. I wore this to work with sock booties and a turtle neck. Paired with leather jacket to go outside. The dress is very well made and comfortable. The only annoying aspect is the layers underneath can get caught so after using the restroom make sure nothing is bunching. Loved this skirt. Very high quality and conservative yet unique and fun design. It was a bit long for me at 5'3'' but higher heels helped! I usually wear a 2 or a 4 and the 2 fit great with plenty of room. The material is not too heavy so it flows nicely and is not too warm. Got lots of compliments on this skirt at work. Fit well. Nice for fall weather. 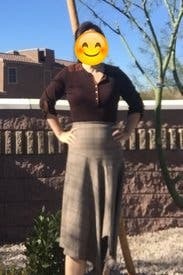 Not photogenic but I love this skirt! Looks can be deceiving, I love this skirt! I had to size down because they didn't have a size 8, and the 6 was snug. I'm like a 7. The fabric did hug my tummy but it was well constructed, so it gave my impossibly wide waist some form. It looked better with my shirt untucked and a cardigan. I love the asymmetrical pattern and nice fabric. It was conservative but interesting. Cons, it's not for apple-shaped figures, it looks good on people with thin/slender builds. If you don't mind a more casual look, an untucked shirt can hide a lot, so can a cardigan. But if you don't care about pictures and just want an interesting well-made skirt, this is for you. Fit was small, sized up and it fit great. Flattering and very cute. Nice skirt got complaints all day! The waist does run a little big but nothing to complain about. The hem made to skirt! 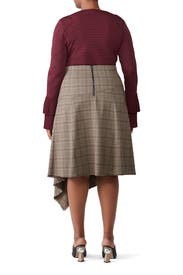 My daughter described the skirt as business meets Little House on the Prairie-not exactly my desired look. I didn't love this skirt. Too much going on with lots of weird angles and the colors were really blah. I found it frumpy and wasn't compelled to wear it a second time. I wouldn't rent this again. Nice fit, thick material, nice hemline with flirty drape. 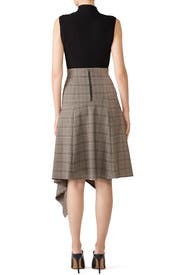 I love the asymmetrical hem on this skirt. It fir perfectly and was very comfortable. Perfect with tights and booties for work. Flowy and comfortable - loved the style. Wished I would have had a brown shirt to wear with it, but worked with a black shirt. Would rent again. Nice skirt for work. Midi length for me. Asymmetrical hem "jazzes" it up and provides interest. Garnered lots of office compliments, which - of course - never get old :) A tad large on me, but I'm losing weight at the moment, so I guess I need to shut up on that part (lol). I planned to wear it to work but the fit was slightly off. Never wore it. Beautiful, well-made, high-quality skirt. Love the asymmetry and the pattern. Lots of compliments. There's no stretch in the skirt and it runs a touch small. It's also high waisted. For my body, that was all fine, but if you're between sizes, go up. I absolutely fell in love with this skirt. Everything is perfection from the asymmetrical, handkerchief inspired hemline, to the masculine pattern, the quality of the fabric, flattering fit and more! I wish I could've kept it, but will definitely be renting again. *Follow my fashion blog @ www.themodernladylike.com if you'd love to see more RTR pieces styled! 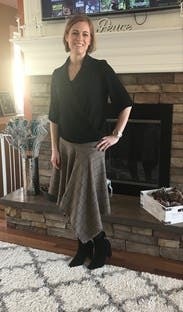 I loved wearing this skirt! 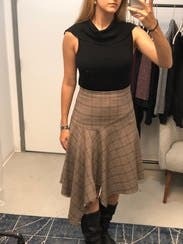 Just the right amount of flounce, and, importantly for someone 5'9" who is wearing this to work, the hem's highest point is not too high (and the amount of drape makes it not super-obvious). I didn't take a photo of this one, but wore it with a tucked-in thin black turtleneck sweater. It fits really nicely & is a good weight - not too heavy/hot. I like the edging & asymetrical part. Overall a nice classy skirt for fall/winter. Easy to throw some leggings/tights & boots under. Big client meeting but did not want to wear the usual blazer and pants. 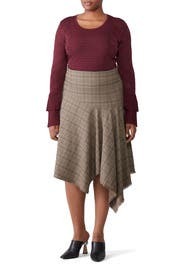 The skirt is soft and so comfortable. It felt like it was a wee bit on the bigger side but hung nicely. I got many compliments on it. I may wear it again before I return it. 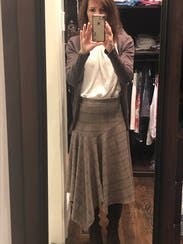 Maybe a tiny bit tight around the waist, but truly a unique and beautiful skirt. I paired it with brown knee boots and cream colored sweater and received compliments all day. I love this skirt! It fits great, laid well on my body. Very versatile. I could wear this all year! Perfect for work as a sort of dress up day in my casual office - wore it with tights and knee high suede boots. 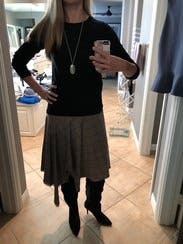 Lots of compliments both from female and male (non-creeper) colleagues....sort of the "hey - you look nice, that's sort of different" kind of thing. Nice quality, and lies smooth even in a currently sort of lumpy midsection.